this information resource is designed primarily for the use of critics, authors, students, promoters or anyone else who has a need for accurate and reliable biographical, discographical or other information. If what you need isn't here, e-mail. 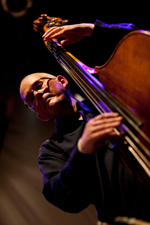 Simon H. Fell studied double bass under Peter Leah at Batley Grammar School and Huddersfield Polytechnic. By the age of 16 he was playing professionally, accompanying some of the world's most renowned cabaret performers at the legendary Batley Variety Club. He received his M.A. from Cambridge University in 1984, having studied at Fitzwilliam College. He is best known as a composer/performer in the fields of improvised music, contemporary composition and experimental jazz, where his reputation has grown consistently since 1983; he is described by the Penguin Guide To Jazz as "a very fine instrumentalist (with) a fine technique and a great flow of ideas." He has been awarded numerous Bursaries and Grants from the Arts Council of England and other organisations to further his performing technique and compositional studies, with the resulting work touring nationally in 1989, 1991, 1992, 1993, 1995, 1996, 1998, 2001 & 2005. Over 100 recordings of works/performances have been issued. Performing units Hession/Wilkinson/Fell, Fell's improvising trio with Alan Wilkinson and Paul Hession was one of the earliest units to receive great acclaim; other regular or occasional groupings have included the trio Something Else with Mick Beck, Badland, the Brötzmann/Wilkinson Quartet, VHF, Butch Morris' London Skyscraper, Derek Bailey's Company, The ZFP Quartet with Carlos Zingaro and the string trio IST. His own composition-based groups include SFQ with Alex Ward, Gail Brand, Alex Maguire, Mark Sanders & Steve Noble, SFT and SFD. More recently, he has toured the US and played the Victoriaville Festival with a new grouping of Joe Morris, Alex Ward, Simon Fell. Other collaborators He has also worked in small or medium groups with John Butcher, Peter Brötzmann, Lol Coxhill, Billy Jenkins, Joe Morris, Keith Tippett, Derek Bailey, Han Bennink, Thurston Moore, Lee Ranaldo, Ellery Eskelin, Tim Berne, Evan Parker, Michel Doneda, Duck Baker and numerous others, plus with John Zorn & Joey Baron (as part of Company) with Elliott Sharp, Billy Bang & Christian Marclay (as part of New York Skyscraper) and with Tristan Honsinger, Cor Fuhler, Peter van Bergen, Wilbert de Joode & Wolter Wierbos (as part of the DIA Ensemble); Simon was also a founder member of London Improvisers Orchestra, and composed for and conducted the group for eight years. He has performed Cardew as a member of Dal Niente Projects, alongside Dave Smith, Ian Mitchell, John White, etc., and has collaborated with the Basquiat Strings. Aditionally, he was for three years a member of the Steve Reid Ensemble, and toured with Steve, Gilles Peterson and Kieran Hebden (Fourtet). Since 2010 Simon has been a member of the Vincent Mondy Quartet. Festival appearances: UK include: Oxford Jazz Festival, Company Week, Outside In Festival, Leeds' Termite Festival, Other Music Festival (Sheffield), Cambridge Conference of Contemporary Poetry, SPNM Oneday at the ICA, LMC Festival, London Jazz Festival, Norfolk & Norwich Festival, Unsung Music Festival at The South Bank, Oxford Festival of Contemporary Music, Manchester World Music Days, Leicester Jazz Festival, Stirling Le Weekend, Manchester Jazz Festival, Manchester New Music Festival, Freedom of the City Festival, Open Ears Festival, BBC Electric Proms, Huddersfield Contemporary Music Festival, Incus Phoenix Festival, Liverpool Cornerstone Festival, Birmingham Harmonic Festival. Festival & club appearances: international include: Company Week in New York, Leipzig Jazztage, Sound Symposium (Newfoundland), Groupe de Recherche d'Improvisation Musicale 20th anniversary series (Marseille), Porto European City Of Culture, Total Music Meeting (Berlin), Nickelsdorf (Austria), Zurich, Köln, Stakkato (Berlin), Contemporaneamente 2002 (Lodi, Italy), Guimarães Jazz Festival (Portugal), Poetry & Music: Liège (Belgium), Ulrichsberger Kaleidophon (Austria), Offene Ohren (München, Germany), Casa da Música (Porto), Banlieues Bleues (Paris), Festival R de Choc (Paris), Issue Project Room (New York), An Die Musik (Baltimore), Victoriaville Festival (Canada), Jazz ao Centro (Coimbra, Portugal), Festival Densités (Fresnes-en-Woëvre), WORM (Rotterdam), The Bimhuis (Amsterdam), ZomerJazzFietsTour (Groningen), Influx (Toulouse), Festival Jazz & Blues à Chancelade (France), Cuivres en Fête (Limoges), Festival Jazz de Vie (St. Gilles-Croix-de-Vie, France), Festival Éclats d'Émail (Limoges), Festival Le Bruit de la Musique (Saint-Silvain-sous-Toulx, France). His compositions, in both jazz, classical and 'fourth stream' idiom, have been performed throughout Britain and have been broadcast on BBC Radios 1, 3 & 4, plus UK Independent Radio, the BBC World Service and radio or television stations in France, Belgium, Sweden, Switzerland, Italy, Austria, Holland, Australia, Canada, New Zealand and the U.S. He has presented compositions for improvisers at the LMC Festival, the Termite Festival, the Frakture Festival, Leo Records' Unsung Music Festival, Sheffield's Open Ears Festival, Stirling's Le Weekend, the Freedom of the City Festival, the BBC Electric Proms, the Cornerstone Festival and the Huddersfield Contemporary Music Festival. His researches into concert music and 'fourth stream' composition continue, particularly focussed on advanced composition for musicians from improvised music and jazz traditions. He has had commissions from, among others, the Arts Council of Great Britain, Eastern Arts, Anglia Polytechnic University, Leeds University, Yorkshire & Humberside Arts, CoMA and BBC Radio 3. He is described by the Guinness Encyclopaedia of Popular Music as "a leading composer of his generation, crossing boundaries and creating music of a passion and originality unusual in Britain". His 1998 2-hour 42-piece ensemble work Compilation III was recorded by the Royal Northern College of Music Big Band in collaboration with improvisers drawn from several English cities. His compositions for London Improvisers' Orchestra include Papers, Happy Families, Köln Klang, Ellington 100 (Strayhorn 85), Morton's Mobile, Too Busy and Three Mondrians. Compositions for SFQ include Thirteen Rectangles, Six Bells Pieces and ...the old style.... Kaleidozyklen, his large-scale piece for improvising double bassist and orchestra was premiered (with Fell as soloist) in November 2000. 2001 saw a Radio 3 'Jazz On 3' broadcast of Thirteen Rectangles Version 2, which was repeated in 2002; (the work was subsequently nominated for the 'new work' award in the 2002 BBC Jazz Awards);Too Busy was broadcast by BBC Radio 3 in 2002, and three extended compositions for quintet (Köln Klang, Trapped By Formalism 2 and Gruppen Modulor 2) were specially recorded for and broadcast by 'Jazz On 3' in August 2003. 2005 saw the release of Compilation IV for 60+ musicians, plus a group of performances of related live works, along with the first performance of Thirteen New Inventions, a major solo piano piece commissioned by Philip Thomas. 2007 saw the performance of a concert-length BBC Radio 3 commission, Positions & Descriptions (for 18 musicians & prerecorded materials), at the Huddersfield Contemporary Music Festival; the 18 performers included musicians from the disciplines of contemporary classical music, free improvisation and experimental jazz, drawn from several continents. 2014 brought a major new commission from the Marsden Jazz Festival; The Ragging Of Time was premiered in October 2014 and subsequently broadcast by BBC Radio 3. In 2015 Simon undertook a major archive project, identifying, restoring and preparing performing versions of Derek Bailey's archive of his compositions from the 1960s. Three concerts of ensemble, duo and solo pieces were presented at the Huddersfield Contemporary Music Festival in November 2015; the performance of the substantial Bailey ensemble work Ping, and a similarly restored piece by Paul Rutherford, were broadcast live by BBC Radio 3's Hear and Now programme.